Home Plan Software - Create home plans easily with examples! Edraw Max is a quick and easy home plan software with massive home plan symbols for creating great-looking designs, which makes it quite easy to create home plans, floor plans, office layouts, directional maps and database diagrams. With pre-drawn libraries and more than 6500 vector symbols, you can design home plans super easily! Click here to download free home floor software. You can use the built-in templates to create and present your home plans in minutes. Learn complete home plan guide to get more details, and make your dream home blueprints now! 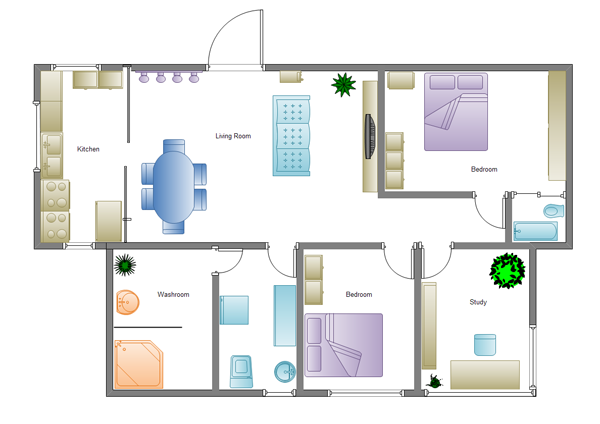 Easy to learn how to use, you can begin drafting 2d floor plans within minutes. Lots of home plan examples will give you an instant head-start. The Home Plan templates can be used to design home plans. Like the Floor Plan template, the Home Plan template includes a wealth of stencils that help you plan elements of your home. For example, you can use the Appliances stencil to define the location of applications such as a stove or refrigerator. The Bath and Kitchen Plan stencil contains shapes for fixed elements such as bathtubs and sinks. In addition to these custom stencils, you'll find all of the standard floor plan stencils so you can add walls, electrical elements, and annotations to your home floor plan. With Edraw you can recreate your home, garden or office in just a few clicks and furnish your plans with thousands of ready-made home plan symbols. It includes thousands of ready-made graphics so you can simply drag-and-drop to create your drawings. These graphics include appliances, bath kitchen, building core, cabinets, furniture, wall, shell and structure, cubicles. Moreover, check out home floor plan software and use bathroom floor planner to create your bathroom designs now! "I really appreciate finding such well-thought-out home floor design software with so many choices and ways to do things. There's a lot of software out there, but after trying several, I'm convinced that this one has the most to offer at a good price - some of the heavy CAD programs are way too much for the likes of me, people who don't need that much power to create some their in-depth plans and drawings. This one provides me with all that I need & want. Thanks again!"